Confusion Mojo Bag - $30.00 : ConjureDoctor.com - Home of Dr. E. Hoodoo Products and Magical Services, Get What You Want! Disorient your enemies and break their concentration with our Confusion Mojo Bag. Poppy seeds along with other jinxing herbs lend their power to confuse making this an effective tool. Our Confusion Mojo Bag is the right tool to carry when you want to sow the seeds of discontent, chaos, and confusion between others. This Mojo works best with a focused intent upon a single specific target that you should name in your petition. INCLUDES A FULL BOTTLE OF Confusion Oil! Carry a Confusion Mojo Bag to give you the upper hand when confusing your enemy. Carry a Confusion Mojo Bag in the workplace to confuse your jealous enemies, break their concentration, and make them fail. Use a Confusion Mojo Bag to gain power against someone who has been treating you poorly or trying to hurt you by confusing their thoughts. Confusion Mojo Bag is part of Dr. E. Products' line of Confusion Hoodoo Products. 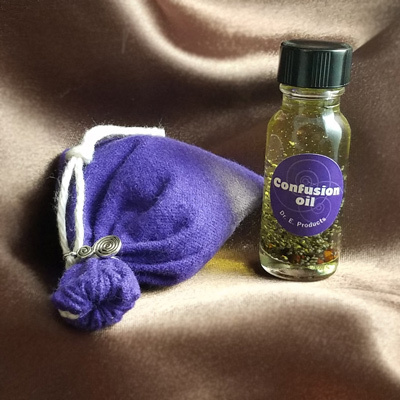 Learn more about Confusion Hoodoo Products and read other spells ideas on the Confusion Products Page.